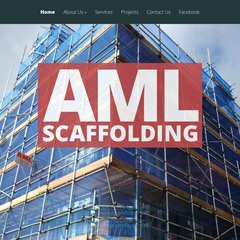 Topics: Aml Scaffolding, Past Projects, Services, Health & Safety, All Staff Are Fully Trained, and Past Projects. It is hosted by Host Routes England, using Microsoft-IIS/7 web server. Its 2 nameservers are ns2.rackspace.com, and ns.rackspace.com. It is written for ASP.NET language. PING (78.136.29.180) 56(84) bytes of data.